My husband is an animated conversationalist! He often regales me with tales and stories from the past and current. I sit and listen to him for seconds, minutes or hours, at times irritated, some times amused, but most of the times awe struck! I guess the inherent qualities of an artist come forth in the expression of speech as well. One such story he told me, soon after we were married, was about him attending early morning classes in school. There was nothing unusual about it until he came to the description of this quaint old eatery serving traditional South Indian delicacies in the early hours of morning sunshine hitting the grand old city of Bangalore! One of the specialities of this place was the masala upma which my husband often had! Upma was a constant fixture in my mother’s house as it is in million’s of other Indian households. But my mother made it plain or sometimes with vegetables, but never with masala in it other than the usual seasoning ingredients like mustard, curry leaves, asafetida, green chili and lime. As I asked Ro to give me detailed descriptions of the masala upma he ate in this eatery, he went on to describe the colour, texture and taste with the aroma wafting through the air and the potent South Indian coffee that went with it. This description conjured up vivid imaginations in my mind, but didnt help very much on the recipe front. With a little bit of thought and experimentation I somehow managed to create the masala upma of my husband’s past and much to my delight, he declared that my masala upma was a notch above what he had eaten many years ago. This is a very flexible recipe and there are many versions and variations to it. You could use fine grain semolina or the coarse variety. I have used both and it works beautifully each time. The water semolina to water ratio is also pretty flexible. Use 1: 2 (1 cup of semolina and 2 cups water) if you want a firm and fluffy consistency and use 1: 3 ratio if you want a soft and mushy consistency. I do both ratios depending on my mood, the vegetables on hand, the occasion and people I’m making it for. 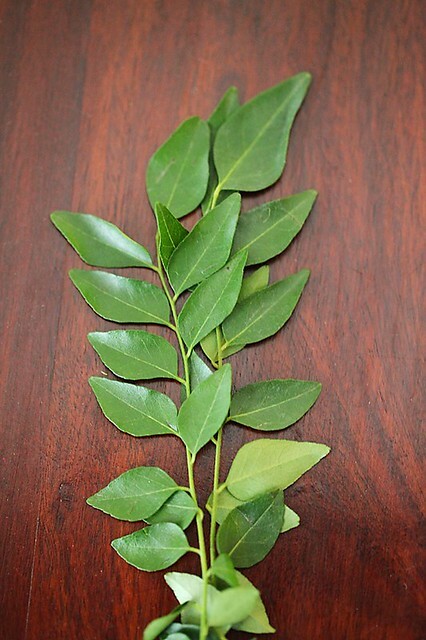 However one ingredient whose importance I can’t stress enough of is that of the curry leaf. It lends a unique flavour and taste to the seasoning and there is no substitute for it. I have tried making this without it once when I didn’t have some on hand and I din’t have that precious pot growing on my window sill only to have the preparation fall flat and only to have me swear that never ever will I make upma without curry leaves! Who would have thought that our humble upma, a breakfast and snack staple in most Indian households would win international acclaim after Flyod Cardoz made it for TopChef and went on to win the competition? My take on this would be that steaming hot upma is simple, easy to make and brings contentment to the heart! When you are overtly hungry, have unexpected guests or have to rustle up something fast, it definitely helps to know how to make this! It is well deserved recognition after all! 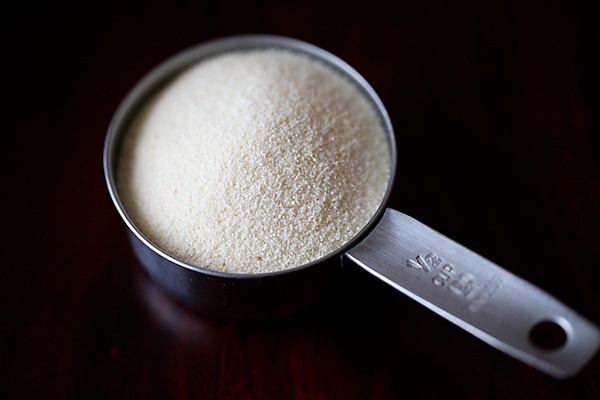 You can use coarse or fine grained semolina here and the vegetables of your choice. To begin with, wash the tamarind well and then place it in a small saucepan with the water over medium heat and allow it to come to a boil. Turn off the heat and let it cool. Alternatively, dissolve the tamarind in water for about 20 to 30 minutes until it becomes soft and disintegrates. Use hot water if you want to quicken this process. 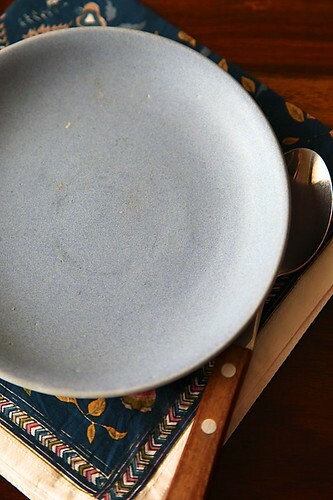 In a wok or kadhai or pan, heat the ghee, until it melts. When the ghee melts, lower the heat, stir in the semolina and roast until it changes colour and releases a unique wonderful aroma, about 7 to 8 minutes. Make sure you don’t over roast the fragile semolina grains. Keep aside. In the same wok or kadai used to fry the semolina, heat the oil over a medium flame but don’t allow it to smoke. Stir in the mustard and when it pops reduce the heat and put in the curry leaves, asafetida and turmeric. Add the cabbage and stir fry for a minute. Put in the rest of the vegetables, stir well and cook covered until half done, about 4 to 5 minutes. You might want to sprinkle a little water in between to prevent charring the vegetables. Put in the tamarind water into the wok with the help of a strainer to remove the seeds and fibre and when it begins to boil, add the sambar powder, red chili powder, salt and jaggery if using. Pour in the rest of the water and bring to a boil. Reduce the flame and put in the toasted semolina stirring all the while. Mix well and allow it to thicken until the semolina grains absorb all the water. Mix in the coconut, cover and cook on low flame for five minutes. Wow, Anu. 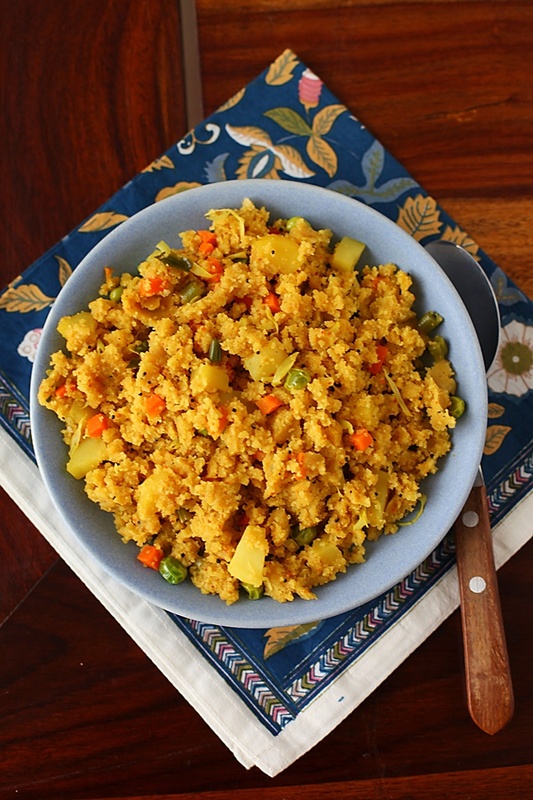 The Masala Upma looks delicious. Brings back many memories for me too! I always experienced irritation on not able to reproduce the khara-bath of the popular darshinis here in B'lore. No looking back now. Made it for breakfast today and we all enjoyed it thoroughly. Thanks so much for sharing. BTW, love your blog. Your mango-pudding has been made several times. Wonderful…..was getting bored of preparing and eating the traditional upma…Thanks for this variation, its gonna be interesting….am preparing this right away as evening snack…..
i did not imagine addition of tamarind and sambar powder. seems great idea. will try it soon. Hello everybody: Thank you for your feedback! Deepika: Glad you like my writing and recipes! Will share my kootu recipe sometime. But, there is a long list of pending requests and it might take some time, so I hope you will be patient. Meanwhile, I hope you continue to visit and enjoy the other recipes here. Mihir: Am happy that this brought back old memories. Thank you for the comment! Madhavi: Thank you for writing! I'm always thrilled to hear from visitors like you who experiment with my recipes and report right back. I hope that you continue to enjoy your upma! Shruti: Hope you enjoyed your evening snack! Vasumathy: Although I do love a plain upma, the addition of tamarind and sambar powder creates miracles in a masala upma, which is an interesting variation to the good old plain upma! FYI, it ought to be "regales" and not "regals" in your 2nd sentence! This is truly amazing artwork. I am amazed by ur pics and narration of food. Few of these recipes are so common in our house yet they feel so special with ur pictures. I use tomatoes and bisi bele bhath or Vangibhath powder to make masala upma. It really lens that warm taste and aroma. Sana: Yes…ofcourse! Thanks for pointing out the typo! Madhura: Thank you very much for your nice words! At times common recipes also seem special to me and I try to bring it out with my writing and pictures! Glad you appreciate it! I'm sure tomatoes and vangi bhath powder would be very delicious in masala upma! Thanks for sharing your tip! This kind of dish is right up my alley. It's light, refreshing and beautiful! Hi Shruti!loved your this recipe as well.Keep up the good work. Ashwini: That's the best part of such recipes…rekindling memories….isnt it? Making your dishes has brought me to admire you as a 'recipe maker'. Thanks much, and hope your inventory keeps growing more and more awesome! 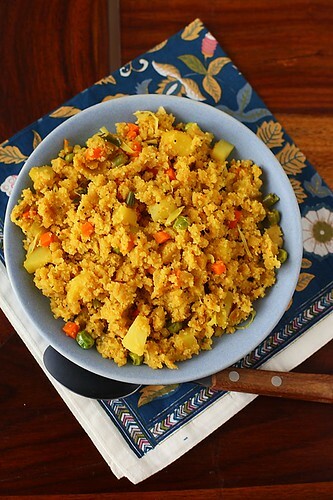 my father loved masala upma i made for breakfast ………its different and tastes yumm .